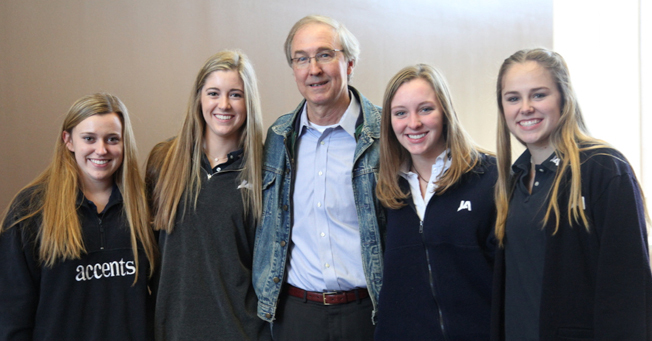 (From left): Kathryn Butler, Caroline Watson, Ken O’Keefe, Abbie Knighton, and Emma Ward. When Ken O’Keefe spoke to students at Lunch to Lead February 16, he was clear to point out that the world needs more than just leaders who can accomplish amazing goals no matter the cost. The world needs leaders with great character. So what are the qualities of a leader of greatness who possesses great character? • is authentic and true where their private life matches their public life. • shines light where there is darkness. • inspires others to greatness. • puts themselves last to serve others. • is willing to lay down his or her life for others. • shows fortitude against overwhelming odds to keep their promise. • dedicates his or her life to helping others. O’Keefe shared examples of people who have demonstrated these qualities, from Winston Churchill, whose character has stood the test of time, to modern day Victoria Leigh Soto, a teacher who gave her life protecting her first grade class at Sandy Hook Elementary. He urged students to be attentive to teachers, coaches, administrative team, and support staff who are serving them in ways that make them a better person. He encouraged students to model their lives after traits of greatness and authenticity they observe and then to become models of greatness for others.